” In Keeping with Donald Trump’s Quest for Value to Voters ” – June 27, _2016. Donald Trump, the presumptive Republican Presidential nominee, is in Phase II to boost his vote gathering process. It is essential to look for and concentrate upon courses of action that will be perceived as satisfactory or good enough by people. Leaders like Donald Trump should spend at least 40% of their time in the following activities to attain a reasonable level of success. His immediate action shall now be to give shape to the following plan in the belief that the chief aim of the leader is to get the right program, in the right doses, in the right places (state, district, precinct … …), at the right time, in the right quality, at a reasonable cost to the program planner as well as to the large beneficiary, that is, the people. Three aspects need special mention and concentrated attention here : Need assessment; Plan; and Program with Actions. 1. 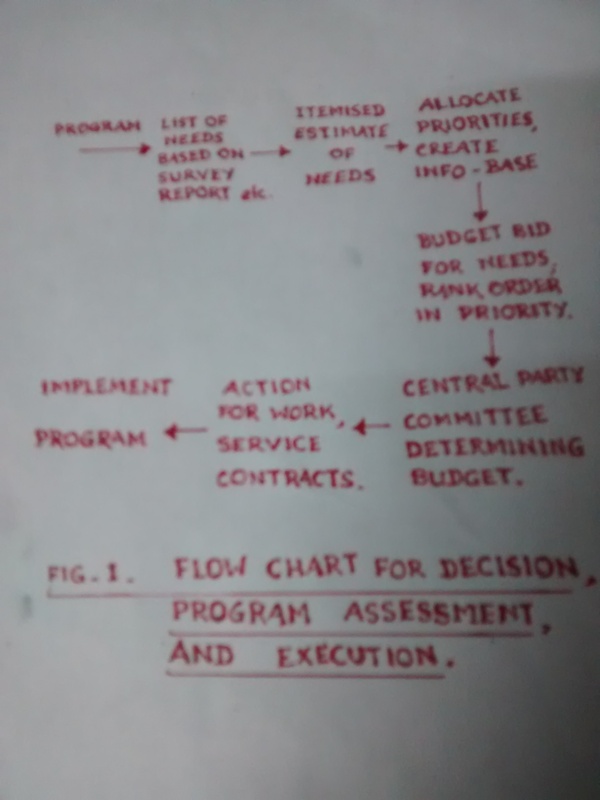 Need Assessment : The figure below presents in the form of a Flow Chart, the key operations/events comprising the above process. Each program offered by the candidate should essentially be based upon the needs of people, an estimate of needs, allocation of priorities, a reasonable budget determined by the party committee, and the necessary activities for implementation. The campaign chief needs to get his members to high speed. A well designed plan is one that meets the present needs in terms of people security, social harmony, financial independence … … and which can be easily and readily adapted to future circumstances. This ensures a satisfying model plan shaping and influencing the overall mental and emotional perceptions of people/voters individually and collectively. This will also help prove to the rival parties and people that there always exists a better way of doing things. 2. Plan : ( Decision-Center for Communication). It is customary for the party organization to plan suitable programs for people with a view to enhance their quality of living and communicate in a way people easily understand them. 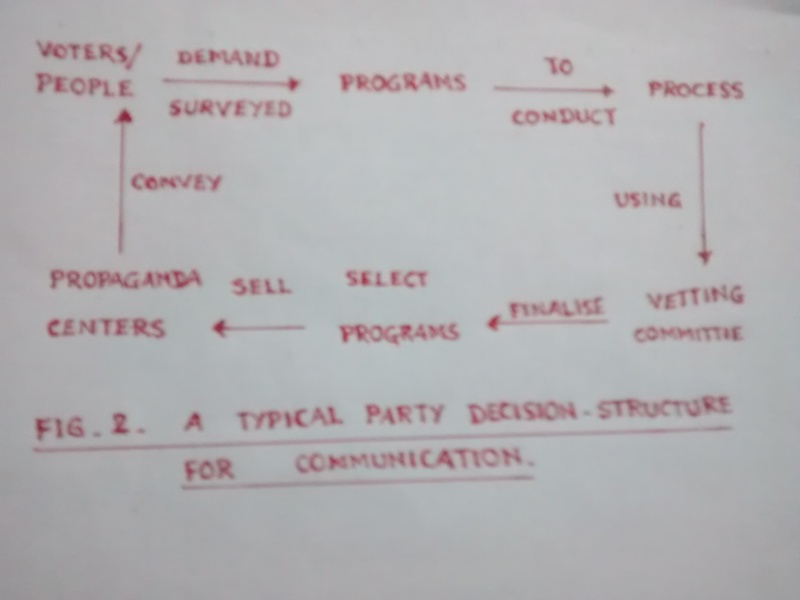 The figure below presents the chief activities of a typical party decision center for communication. The crux of this exercise lies in converting the voter(s) demands into programs, analysed and assessed by an instituted committee. The preliminary programs are finalised after incorporating the ideas of the members of the committee and the same sent to the party constituted Propaganda Centers which by suitable methods communicate/convey the message to people accomplishing the desired ends. This is both an effective and efficient step in the process of election campaign of every contestant. The committee performing this exercise is essentially a facilitating device in the hands of the person shaping the course of the campaign. 3. 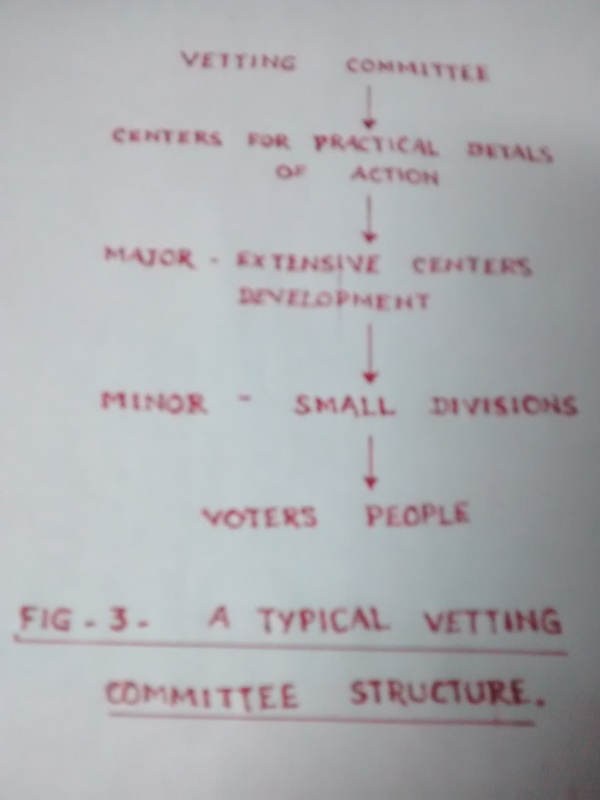 Program and Actions : (Role of the Vetting Committee) The figure below gives the structure and responsibilities of the vetting committee. To promote and in a move to give the finishing touches to the envisaged program(s), the vetting committee comprising its “centers of practical details” play a significant role. It will have major activities divisions and minor activities divisions vetting thoroughly the program in terms of practicability, applicability, adaptability, and utility to people. This committee will essentially act as a ‘problem solving committee’ playing a key role in the campaign process. It will require and receive inputs from various sources as ” survey data; contestant’s conference meets and exchanges; reports of rallies and mass meetings; and any other means of extracting support of candidate with adequate feedback ” . The committee will apply the knowledge, wisdom, skill, and technology in a systematic manner to achieve better and profitable courses of action collectively. This exercise is an example of scientific application of a process rather than relying exclusively on the intuitive processes of one or a small group of heads as is usually the case uptil now. It is also symbolic of the ‘party unity’ capable of raising its image amongst the public. This is real strength. In conclusion, such processes and ethos of the party organization(s) will strongly impact and influence the faith and belief(s) of the people. It will also provide the political organization an opportunity to engage in scientific and technical skills of the organization in the broader context facilitating the diagnosis, formulation, and implementation of proposals.The quest for a better way of doing things – as we commonly emphasize in Business – is also now becoming the professional duty of every politician in this new age in addition to the recognition of the moral obligation of every politician to serve people with high quality stewardship. This alone will make a positive contribution to sustaining and enhancing the peace, harmony, and quality of life of the society in the country, region, and the world. Tidbit : ” Voters : People with short memories “.